What's better than one Bundt cake? Three mini frosted Bundt cakes, of course! 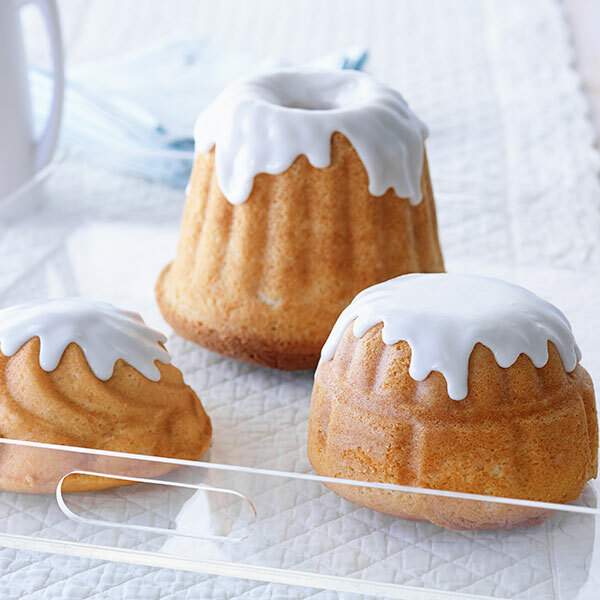 Create three adorable desserts with Hallmark's Mini Bundt Cake recipe. We've also included the recipe for a simple vanilla frosting. Get ready for the oohs and ahhs when you present your array of cute cakes. Butter and flour 3 small Bundt pans, about 6-cup pans. We like using different shapes. Baking spray also works well. Set aside until ready to use. In the bowl of an electric mixer, beat together butter and sugar until pale and creamy, about 5 minutes. Lower speed to medium and add eggs, beating well after each. Then add vanilla. Alternatively, add dry mixture and milk, starting and ending with dry mixture. Mix until well incorporated, but do not overmix. Divide batter between 3 prepared pans. Place two to be baked first on a sheet pan, and bake until a toothpick comes out clean, about 50 to 55 minutes. Cool on a wire rack for about 10 minutes and bake last cake. After cakes have cooled for 10 minutes, invert onto wire rack and finish cooling. After the cakes are completely cooled, make the icing. Mix together powered sugar, milk and vanilla. Icing will be thick. Working on one cake at a time, spoon icing onto tops of cakes evenly. After icing has had a few minutes to harden, transfer to serving platters and serve.